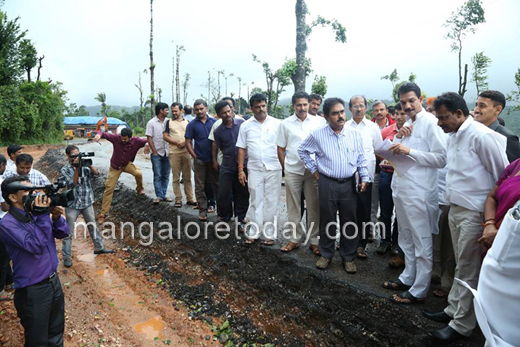 Puttur, June 24, 2015 : The ongoing repair works of Shiradi Ghat stretch of road were inspected by Dakshina Kannada MP Nalin Kumar Kateel on June 23, Tuesday. The MP’s visit followed some complaints that the road works were progressing at a snail pace and that the works may not be completed by the deadline of July 25. Speaking to media persons after inspecting the road works, the MP said the works on 11.6 km out of the total 13 km stretch are complete and hoped that the road would be open for traffic by August 15. He said he has directed the officials to expedite the works so that the road could be thrown open for traffic at the earliest. 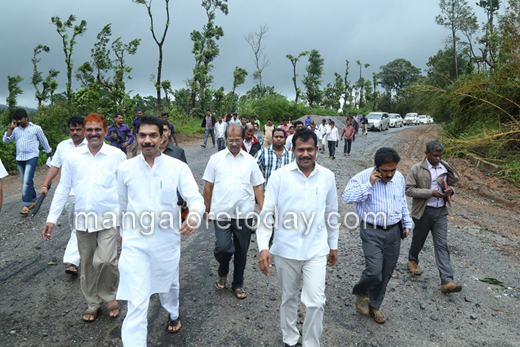 The MP informed that the tender for the second phase of works on Shiradi Ghat is finalised . The road between Addahole and BC Road too would be converted into a four-lane road, he said. Prasanna Kumar, Assistant Executive Engineer of NHAI Sakleshpur Division said the road works had to be stopped since the past few days owing to heavy rains. The works have resumed at present, he said. Asha Timmappa Gowda, ZP Chief, Satish Kumpala, ZP Vice President, S Angara, MLA of Sullia, Krishna Shetty, APMC President and several others accompanied the MP during his visit.